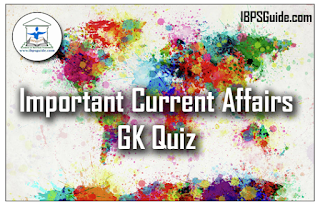 Dear Readers, Here we have given the Current Affairs GK questions based on the previous days Daily Current Affairs updates. 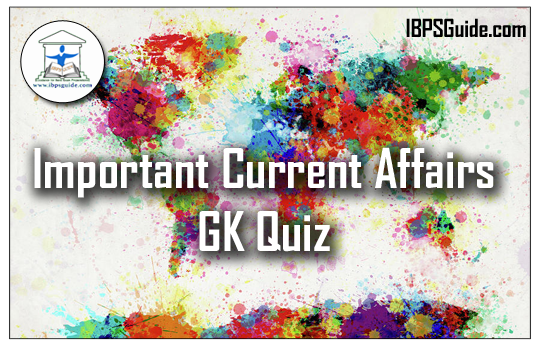 Candidates those who are preparing for IBPS PO/Clerk exam and all other Banking exams can use these questions. 1).What is the theme of Universal Children’s Day? a) Stop Violence against the Children. Explanation: Universal Children’s Day is being observed today (Sunday) to promote international togetherness, awareness among children worldwide and improving children s welfare. The theme of the day this year is Stop Violence against the Children. 2).What is the theme of World Day of Remembrance for Road Traffic Victims 2016? Explanation: Third Sunday of November: World Day of Remembrance for Road Traffic Victims. The World Day of Remembrance for Road Traffic Victims was observed globally on 20 November 2016 with the theme Vital post-crash actions: Medical Care, Investigation, Justice!.The Day is observed on every third Sunday of November by an increasing number of countries on every continent around the world. It is observed to remember millions who were killed or injured in road crashes. The Day has also become an important means to reduce road casualties. 3).Which ministry launch Pradhanmantri Grameen Awas Yojna to provide 3 crore affordable housing units across country? Explanation: Prime Minister Narendra Modi will launch Pradhanmantri Grameen Awas Yojna, an ambitious housing scheme meant for rural poor in Agra today. The housing scheme is expected to provide affordable houses to all those living below the poverty line by the year 2022. 4).Union textile minister Smriti Irani inaugurated thematic handicrafts exhibition and launched a scheme of textile ministry ‘pehchan’ identity cards in which of the following state? Explanation: Union textile minister Smriti Irani inaugurated thematic handicrafts exhibition and launched a scheme of textile ministry ‘pehchan’ identity cards to artisans in Ahmedabad, yesterday. She distributed ‘pehchan’ cards to artisans from five clusters of Gujarat namely Jamnagar, Naroda, Surendranagar, Amreli and Kalol. 5).World’s first Bollywood-themed park opens in which city? Explanation: Bollywood Parks, Dubai has opened with fanfare, fireworks, dance, music and simulator 4D shows based on hit Hindi-language movies. Visitors were greeted by ­performers dancing to thumping Bollywood music across the park with some atop a mock-up of a suburban Mumbai railway train and others outside the ­Rajmahal theatre, which will stage live musicals. 6).World’s first Genetic Garden of Halophytes (naturally occurring salt-tolerant plants) was inaugurated at the coastal town of Vedaranyam in which state? Explanation: Tamil Nadu gets world’s first salt-tolerant plant garden , The world’s first Genetic Garden of Halophytes (naturally occurring salt-tolerant plants) was inaugurated at the coastal town of Vedaranyam in Tamil Nadu. The first of its kind garden in the world was inaugurated by Mauritius President Ameenah Gurib Fakim through video-conferencing. 7).The Reserve Bank of India has proposed opening _______ in conventional banks for “gradual” introduction of Sharia-compliant banking in India? Explanation: The Reserve Bank of India has proposed opening “Islamic window” in conventional banks for “gradual” introduction of Sharia-compliant banking in India. “Initially, a few simple products… similar to conventional banking products may be considered for introduction through Islamic window,” RBI said. Islamic banking is based on principles of not charging interest, which is prohibited under Islam. 8).Who has been honoured with Dr Nagendra Singh International Peace Award for his efforts in ensuring world peace? Explanation: Spiritual guru Sri Sri Ravishankar was on Sunday honoured with an international peace prize for his efforts in ensuring world peace. Home Minister Rajnath Singh gave away the “Dr Nagendra Singh International Peace Award” to the spiritual leader at a function at Vigyan Bhawan in Delhi. Explanation: India and Cyprus has signed a new double tax avoidance pact under which capital gains tax will be levied on sale of shares on investments made after April 1, 2017, bringing the island nation at par with Mauritius in terms of tax treatment. The latest pact would replace the existing Double Tax Avoidance Agreement (DTAA), which was in place since June 13, 1994. 10).Who was appointed as the new Executive Chairman of the National Legal Services Authority (NALSA)? Explanation: The Union Government on 18 November 2016 announced the appointment of Jagdish Singh Khehar as the Executive Chairman of the National Legal Services Authority (NALSA).Khehar, a judge of the Supreme Court, will succeed Anil R. Dave. 11).CVR Rajendran as MD& CEO which bank? Explanation: The Reserve Bank of India has granted approval for appointment of C.V.R. Rajendran as the Managing Director& CEO of Catholic Syrian Bank for a period of three years from the date of his taking charge. Rajendran is currently holding the position of Chief Executive Officer of the Association of Mutual Funds of India. Prior to this, he has held other key positions like Chairman and Managing Director of Andhra Bank and Executive Director at Bank of Maharashtra. 12).Name the badminton player who has won China open Series title 2016? Explanation: PV Sindhu won the China Open on Sunday, to register her first tournament win post the Rio Olympics. World number 11 Sindhu defeated ninth-ranked China’s Sun Yu 21-11, 17-21, 21-11. This is the third straight year that an Indian woman has made the China Open final, with Saina Nehwal winning the title in 2014 and finishing as runner-up in 2015. 13).Who has been conferred the prestigious Mother Teresa International Award by the Mumbai-based NGO Harmony Foundation? Explanation: Shaikh Abdullah Bin Zayed Al Nahyan, UAE Minister of Foreign Affairs and International Cooperation, has been conferred the prestigious Mother Teresa International Award by the Mumbai-based NGO Harmony Foundation. Shaikh Abdullah is being honoured for his work in establishing institutions that protect youth from being radicalised and indoctrination from terrorist groups and persons looking to propagate violence against innocent people. 14). Eliud Kipchoge wins men’s Delhi Half Marathon, he belongs to? Explanation: Reigning Olympic marathon champion Eliud Kipchoge of Kenya won the men’s race of Delhi Half Marathon in a fast time but below the course record while Ethiopia’s Worknesh Degefa clinched the women’s title today.Kipchoge clocked 59 minutes and 44 seconds to cover the 21.097km distance. Ethiopia’s Yigrem Demelash came second and Kenya’s Augustine Choge was third. 15).Former world champion Manavjit Singh Sandhu clinched the gold medal in men’s trap event at the 60th National Shooting Championship for Shotgun, which city host the 60th National Shooting Championship for Shotgun? Explanation: Former world champion Manavjit Singh Sandhu clinched the gold medal in men’s trap event at the 60th National Shooting Championship for Shotgun in Jaipur today. The four-time Olympian from Punjab shot 117 in qualifying to reach the six-man final rounds in fourth spot.